I was at Giant Hypermarket in Puchong on the 28th of February 2016 at about 12:00 noon when I rolled my shopping cart to the fast checkout lane, the lane for those who are purchasing 10 item or less. I found that there was someone in front of me with 20 to 30 items in his shopping cart. I pointed to the sign that showed this lane was for those who had 10 items or less. He just ignored me and waited in line for his turn to check out. After a waiting for a while I realised that he would not go to the other lanes where he could check out more than 10 items, I decided to video tape the whole incident. He knew I was making a video of the incident, even the customers at the back and the cashier knew I was taping the incident. I told them I was going to put the video on the internet. When it came to his turn to checkout, he got his 2 other family members to make payments separately so they broke one shopping cart of goods into 3 receipts. Watch the video and you will notice the man had a real attitude. It was "What can you do? Nothing" attitude. He can break any rules or laws and there is nothing you can do about. He was so confident that after I stopped recording the video and he laughed at all of us as he was getting away with checking out 20 to 30 items in a 10 or less item lane. How can they keep coming back and hitting me with claims. Every time they cancel the claim and withdraw the charges and then a few years later they charge me again. These are very vindictive people and they have been constantly harassing me and have dragged me into the courts for years. 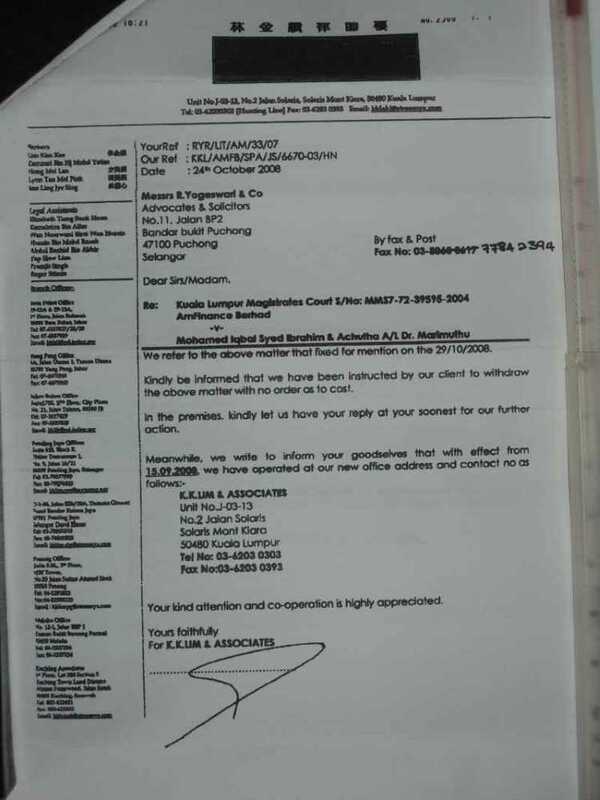 This is the bank, the dumdum bank, I mentioned in my previous article on banking problems in Malaysia but I never identified the bank so that no one would know which bank it was but they have identified themselves in the letter below. Don't they know that you can only charge a person once? What law are they applying? Are they above the Malaysian law? Which means they do not have to follow the law and do as they please? After publishing my previous article on the many banking problems in Malaysia on the 26th of February 2016, they sent me a letter predated as 23 February 2016, which I received on Wednesday 2nd of March 2016. It is very common for people in Malaysia to predate letters to pretend they sent the letters earlier. In fact on this letter the is no postage mark!. These people are very dangerous as what they are planning to do is to take you to court and show the predated letter to the judge to justify their claims or they are trying to show that their action was carried out earlier by predating letters. Worst still some don't even send you the predated letter and when in court show their copy of the letter to the judge to imply that you are untrustworthy and delibrately did not respond to their letters. 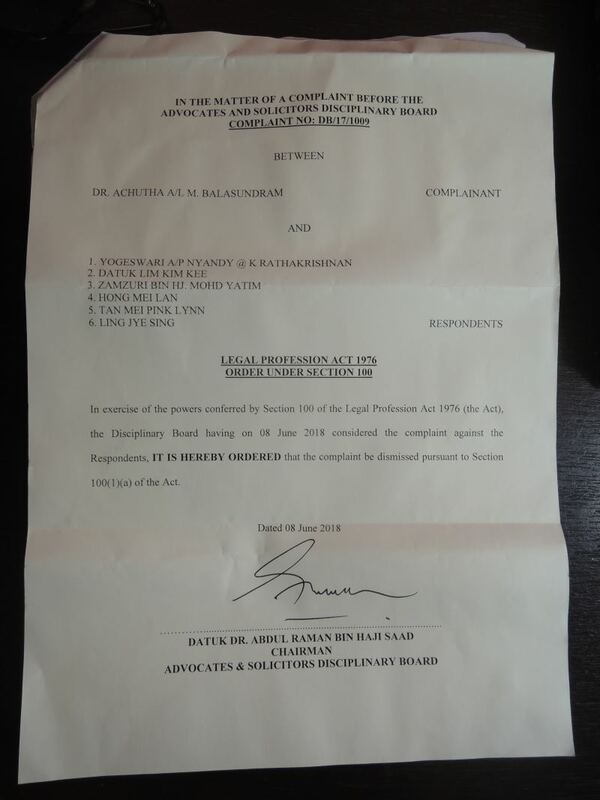 The shocking part of this attempted 3rd claim against me is that all this was settled in the magistrate's court where the AmBank lawyers agreed to drop the charges against me. After dropping the charges in court they want to charge me again? Who are these people? My God, from this AmBank letter you can see that they are in hiding. They do not want anyone to know who authorised this letter. Are they scared to be identified as those who are punishing me again and again? They know my name so why can't I know their name? The foreign reader will notice my name in the AmBank letter is not Peter Achutha but Achutha A/L Dr. Marimuttu .... This is the name the Malaysian government assigned to me. The government has changed it a few times so you may see it differently on different legal documents. The "A/L" in the name is Malay for "son of" and does not indicate that we are Muslims. On the contrary it indicates we are non-Muslims. If I am correct, only people from minorities races have government names assigned to them. My ancestors did not have any surnames or family names. My name is Achutha or Peter or Peter Achutha and that is it. I use a government assigned name for all legal documents. What is really bad is that the original loan amount was about RM18,000 but now they have increased it to RM36,985.15 and worst still I did not borrow any money from AmBank. They are making my life a living nightmare. I do hope the Lord God's judgement falls very severely on these people. This is the third time they are bring this charge against me after it was understood that I had done my duty and they were in the wrong. Are they trying to declare me a bankrupt by changing the amount due to above RM30,000? In Malaysia, you need to owe RM30,000 and more before you can be declared a bankrupt. I have seen many powerful people trying to ruin my life and they are all hiding behind the scenes so that they cannot be identified. Cowards really. Isn't there a limit as to how many times you can charge a person on the same issue? They are pretty confident that they can do what they like and charge me again and again for the same 'offense' and get away with it. Their attitude is that "What can you do about it? Nothing. We will keep targeting you again and again as it is so much fun watching you scream in terror." How did this car loan come about? During the Asian Financial Crises of 1997, a 'friend', Mohd Ali Jinnah, called me to help him with his factory operations at Adevulc Sdn. Bhd. in Kg Bahru, Sungei Buloh. Mohd Ali Jinnah was the owner and managing director of Adevulc Sdn. Bhd. He told me that his factory had not made any money for a year and the only person he knew that could turn around his factory operations was me. He offered me a salary of RM2,000 per month, as Assistant to the MD, which he did not pay for more than 9 months. I came in and over the next few months found many problems in his operations. Firstly, he had a salesman that gave the wrong feed back from customers and was chalking up RM1000 to RM2000 in hand phone bills which I think were to his girlfriend, so that salesman had to go. Then, as I had a lot of experience in manufacturing operations, I reorganized the operations of the company, began sourcing free raw materials. Ali had previously purchased the raw materials. And I began to look as to why the recycled rubber was failing as it was of very poor quality. In the mean time I attended the Diploma in Plastics and Rubber course at RRI Sungei Buloh, (graduate no. 2 in the whole country) so that I could learn about rubber and how to manufacture rubber products. To cut a long story short I invented a new way of recycling rubber and found paying customers for Ali and we began to make profits. Years later, in 2004, when the AmBank lawyers, K.K. Lim & Associate, contacted me I found out the car loan was in Mohamed Iqbal Syed Ibrahim's name. That was when I realised I was caught in a scam. I had never met Iqbal before Adevulc Sdn. Bhd. and I would never sign up as a guarantor for Iqbal as he was a lorry driver and could not afford a car. 1. How could they approve an employee of a company to stand as a guarantor for the company directors? Of course any employee does not want to loose his job especially during a recession. 2. I signed an agreement for Mohd Ali Jinnah to purchase the car and not for Iqbal, his brother. How did they change the name. I would never stand as a guarantor for Iqbal. I even wrote to the CEO of AmBank and hand delivered a letter to his penthouse office and got the secretary to stamp the date they received the letter. In that letter I had asked the CEO of AmBank how they managed to switch the name from Mohd Ali Jinnah to Mohamed Iqbal Syed Ibrahim? The CEO of AmBank never replied to my letter. All of them kept quiet. 3. How did AmBank approve the car loan for Ali or Iqbal. Ali never paid any of the installments. 4. Why did they not inform me that Ali or Iqbal was not paying any installments as I would have chased him for the payments? Why did the bank keep quite for almost 6 years. The hired K.K. Lim & Associate just before the 6 year statute of limitations was going to be over. Actually with the above letter dated 23 February 2016, AmBank has charge me 3 times to force me to pay for money I did not borrow. They never chased Ali or Iqbal for the money. The first time was sometime, I forget the dates but I think it was around 2004 when K.K. Lim & Associates wrote to me. I found Iqbal and he was running a mamak (Indian Muslim) restaurant in Mentari Business Center, near Sunway Lagoon. Wow, Iqbal must have had plenty of money to open and run a restaurant business. He was not paying the bank loan? Normally, it is the practice of banks to drop charges against guarantors once they find the borrower and info the bank where he is located. I went to AmBank debt collection department and explained where Iqbal was and he was operating a mamak restaurant. I spoke all this to the Indian debt collection manager at Ambank. They verbally dropped the charges against me and everything was quiet for a while. One day K.K. Lim & Associates wrote a letter that the bank wanted me to pay up all the money owed by Ali or Iqbal. This was the second time they were charging me. They kept dragging me into court every 3 months for the next 4 years until I managed to find a lawyer who would defend me. During those 4 years when I was forced to go to court to show my face, I had to defend myself and ask time to earn some money to get a lawyer. If I had missed even one court attendance, the bank's lawyers would have requested the magistrate to pass judgement on me. Luckily, I attended court every 3 months and during one of those sessions asked the bank's lawyer what they had done to get payment from Iqbal. The lawyer admitted that they had not approached Iqbal for outstanding payment. What a shocking revelation that was. The bank was not chasing Iqbal? Even after I told them where he was? What was the bank and its lawyers doing? This sounds very suspicious. The court summons was MMS9-72-39595-2004. You will notice that AmBank is sometimes referred as AMFinance. I am not sure why or whether AmBank kept changing its name. I have not found all the letters from the lawyer's correspondence but here is just some samples or else this webpage will get too long. There were more correspondence between my lawyers and their lawyers before they finally dropped the case against me but after they blacklisted my name in CTOS. Such wicked people. 1. How can guarantors be blacklisted under CTOS as they did not take any money. We all know that the guarantors never borrowed any money. The lawyers, CTOS and the bankers know that the borrower is the one who took the money from the bank. Why does CTOS accept and inserts names of guarantors into their blacklist? 2. Why did they blacklist my name under CTOS when they were dropping the case against me? Finally, I attended the last court session, even though my lawyer did not want me to attend, I think it was in 2009. At that session both lawyers, my lawyer and the bank's lawyer, decided to drop all charges and never charge me again in court. The magistrate was very professional and helpful. The lawyers agreed in front of him not to charge me in court again and to drop all charges against me. I forgot to ask him to tell the bank's lawyer to inform the bank to pay my legal fees. "Last year Ali told me Iqbal had passed away and he would bring me the death certificate to show me, but he never did. Last month one of my friends spotted him in Taman Sri Muda, Shah Alam alive and kicking. Praise be to the Lord God, AmFinance borrowers can be raised from the dead. How fortunate is AMFinace to have such clients, Praise the Lord God." Then a few years ago, about 3 to 4 years ago, I met a close friend of Ali and he in informed me that Ali had passed away from 4 stage mouth cancer. I really do not know whether this was truth or fiction as I heard many rumours about Ali and that he had moved his factory to Rawang where no one could find him. It was said that his son is helping him operate the factory. 1. They claimed they auctioned the car but the lawyers would not show me the auction receipt. Did they really auction off the car? 2. Why did they auction off the car at a very low price? 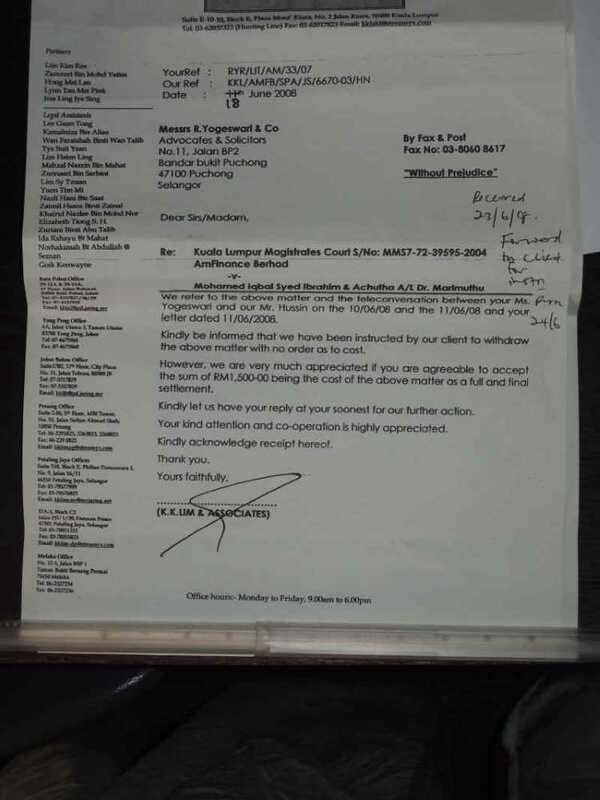 After the alleged auction, the bank was still owed about RM18,000/-. 3. Why did they not ask me first before they auctioned off the car. As I am the alleged guarantor, I should have been given the first choice as to whether to take over the loan or chase Ali or Iqbal or sell the car at a reasonable price, right? Don't I have any rights? 4. What is worse is that the bank's lawyers refused to provide any evidence or documents in court. They just dropped the case as they did not want to reveal any documents. Why were they hiding the documents - they did not want them to be filed in court as evidence against me? It looks like the banks are using the legal system to blackmail guarantors into making payments even if there is insufficient evidence against the guarantor. These lawyers should be disbarred for taking a bank guarantor case without any evidence, right? This is because these are easy cases to handle, either you have evidence or you don't. If they cannot show evidence then they cannot charge the person in court, right? They were just gaming the legal system to blackmail the alleged guarantors into making payments. After refusing to file any evidence in court they blacklisted my name in CTOS. How wicked can they get. Was it not because they did not want or could not reveal the alleged evidence against me, that they blacklisted my name in CTOS out of vengeance. Why did AmBank allow all this to go on? In January 1997, while I was doing a tempory job in an accounting firm, I had told some of the staff that the stock market would crash that year. My predictions came true. We all know what happened next. The government was in a panic and they did not know what to do. They were so terrified that the shares collapsing, that the commodity prices were collapsing and the currency was devaluing at a very fast rate. They were even asking Malaysians to donate their gold jewellery to the government but no one did, not even the politicians. Tun Dr. Mahathir was in Japan in June 1998 and he announced that no one had predicted this crash. That was when I began to write to him through the Letters to the Editor of the New Straits Times newspaper. I told him that I had gone to many institutions to ask for help to fund my research but no one helped me. I had predicted the stock market crash but no one believed me until it happened. So while I was working in Adevulc Sdn. Bhd. 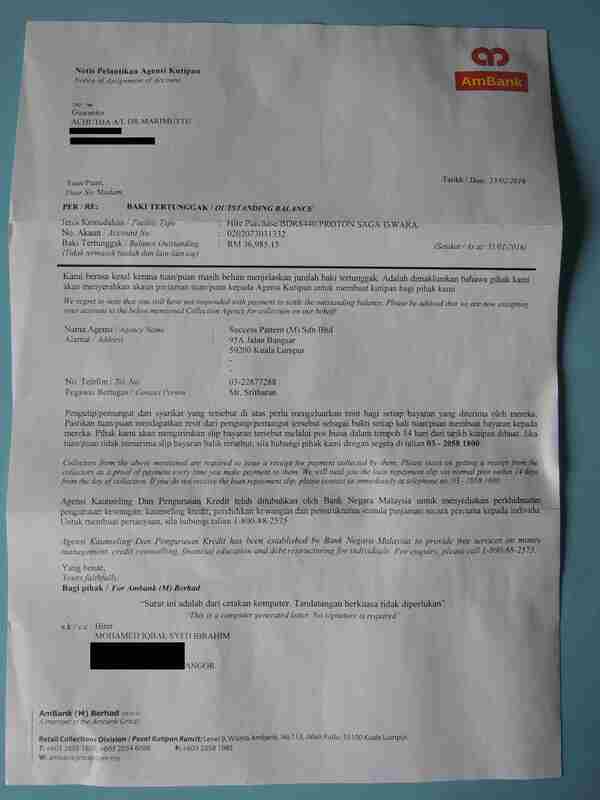 without any pay I began to write to Tun Dr. Mahathir. The first thing I did was to calm them down and then I began to explain what was happening and over many letters I explained what to do to stop the crisis and begin economic recovery. You can check with the editor of the Letters to the Editor of the New Strait Times and ask them for a copy of all my letters to verify my work and service and assistance to the Malaysian government. What is more amazing is that since I was broke, as I had spent 14 hours a day 7 days a week for many years developing this Alternative Theory of Economics, I had to borrow money to pay for bus fare to deliver my letters to the New Straits Times at Jalan Riong, Bangsar, Kuala Lumpur. My book, Market Theories & Predicting the Stock Market by Visual Inspection, does not show all the letters to the Prime Minister, as my computer hard disk crashed and I spent weeks trying to recover all the files. I was too broke to afford a backup disk or external hard disk so I had no backup copies and I lost a lot of work. 1. I explained that interest rates must come down. Westerners and the IMF were insisting that the interest rates must go up. If my recollection is correct, they even wanted Malaysia to scrap the Bumiputera privileges. The government and Bank Negara had brought the interest rates very high to prevent a lot of money leaving the country. The man in the street, as a result of high interest rates, was unable to make car loan and house loan payments. The authorities' attempted but wrong solutions for one problem was creating additional other problems. Companies were closing as they could not pay back the loans and properties prices were falling. The banks were pulling back everyone's cars. They had huge tracts of land with parked repossessed cars. Had the banks gone mad? People need their cars to go to work otherwise they would lose their jobs. The banks did not care. I told Tun Dr, Mahathir to stop the banks from repossessing cars and houses so they defined a NPL (non performing loans) as one in which payments were not made for 6 months. 2. I had mathematical models to predict car sales volumes. I had developed these models between 1992 and 1997, without any funding. In fact sometime in the mid 1990's I had met the CEO of Perodua and had predicted for him that Perodua would have 40% to 60% of the car market share in Malaysia. During the 1997 Asian Financial Crisis Proton operations had dropped from 3 shifts a day, 7 days a week to 1 shift a day and I don't think they were operating 7 days a week. I used my computer models to calculate and inform the Prime Minister that if they dropped the Proton prices by 20% Proton cars would begin selling again. Sure enough the sales began. 3. 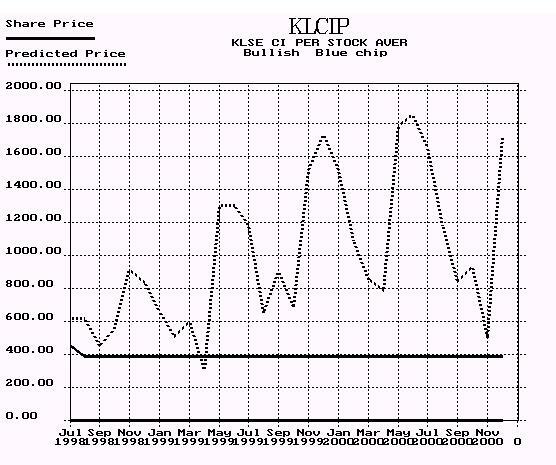 I accurately predict the KLSE stock market Bull Run of September 1998. 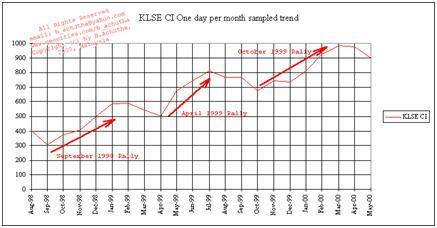 The chart below shows my prediction of the KLCI done in August 1998. The chart below shows the actual historical KLCI trend. You can see that my chart predicted the September 1998, April 1999, October 1999 stock market rallies. 4. While George Soros and his speculators were hammering at the Malaysian Ringgit I calculated and informed the Prime Minister that the currency should stabilize at RM3.80/- to US$1.00/-. Following my explanations, the Malaysian government introduced Capital Controls and set the Ringgit to RM3.80 to the US1.00/- on September 2nd 1998. The stock market Bull Run began as predicted in September 1998 for the next year and more. I had explained many other items and if you do get copies of my letters from the Editor of the New Straits Times you will realize how much help I had provided the Malaysian government even though I was broke and had to borrow money to carry out this service. During this period the Securities Commission offered me an Investment Advisers' License free of charge provided that I would change my company from a sole proprietor to Sdn. Bhd. As I was sending some of my letters to Dr. Dagang at the Securities Commission. I could not afford to change my company as I was really broke and where was I going to get a business partner who could stomach years of research and development without any revenue? As a result of my letters to the PM the entire Cabinet knew who I am. Everyone was reading my letters to the PM and began understand more about economics and crises. Even TV3 made some comments. Many people had copies of my letters to the Prime Minister. I met one Chinses guy who was running a video shop who asked me if I was the guy who wrote those 'z', 'z' equations to the Prime Minister. After reading articles in the News Straits Times during the crisis, I believe several foreign governments and journalist had copies of my letters to the Prime Minister too. Even the stock broking companies knew who I was. I walked into one of these companies and asked them for historical data and they gave me the data free of charge without any hesitation or inquiring as to why I needed the data. When I began selling toys on the streets of Bukit Bintang, some of the patrolling police men & women came a shook my hands. That was how well know I was. You mean to say AmBank staff did not know me? Do you really think that AmBank personnel did not know who I was? Why didn't AmBank ask Tun Dr. Mahathir or Tun Daim, or Yang Berhormat Dato' Sri Mohd. Najib bin Tun Haji Abdul Razak our current Prime Minister or even Datuk Seri Anwar Ibrahim about my work? What did AmBank do during this time? They ran to the government for help as they were repossessing many cars and if you had taken a trip around Klang Valley you would have seen many repossessed cars parked on idle land. Does anyone think the people in power in Ambank did not know who I was? That is really gratitude. I wouldn't be surprised that if I had kept quiet and ignored the crisis and the cries for help from the government, we, including the rest of South East Asia, would have entered a deep deep recession. Many companies would of ceased operations, probably a few million workers would have lost their jobs. And I am pretty sure that AmBank would ceased operations as nobody would be paying the car loans. Many banks to would have paid the price and may not be in existence today. Come to think of it many banks have disappeared already. I called many of the local universities to ask them if they could allow me to publish my work for a doctoral thesis. All of them turned me down. One university told me that Ph.D. is for academics only. Another said I had to sit for a 3 year diploma on Economics. I know why they said this. They wanted me to teach them the mathematics, free of charge, while paying them a fee! Almost all the Malaysian universities hated me for helping then Prime Minister, Tun Dr. Mahathir. The Lord God is really Great. Seeing my difficulty He got an American University to write to me and ask me to publish my theories in Economics. And that is how I received my Doctorate in Economics - from an American University. That was in 2009. I developed a unique theory of Economics that was based upon Probability Theory and Wave Theory. 1. 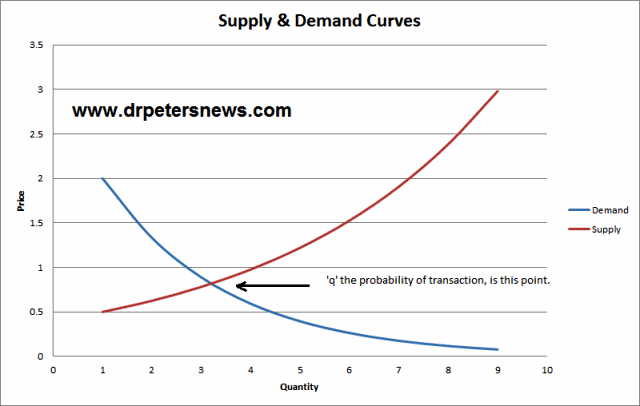 I questioned the standard Supply and Demand Curve chart and showed it was wrong. I believe our local universities are still teaching this to be correct. 3. Later on, I showed the relationship between Demand and Supply and inflation. This meant that if Supply was greater than Demand we would have deflation. 4. I had used Probability Theory to derive most of the equations and explanations. Furthermore I shown that probability can be greater than 1 or 100% and this occurs in Stock Markets. And I invented Group Probability (or Crowd Probability) Theory. 5. Eventually I created Visual Inspection Techniques to predict the markets. That is just by looking at the trend charts you can work out how predict the future trends using Excel worksheets. Anyone studying in Malaysia would be learning the old theory because the local universities did not want me around. I have many inventions to date. Even a new way of making bread. For over 5,000 years bread was made with either the Straight Dough Method or the Sponge and Dough Method which needed a lot of kneading. After one and a half years of experimenting I invented the Batter and Dough Method which does not need any kneading of the bread. I have freely published this method and it variations on my Bread Making Blog so that many people especially the poor and old folks who do not have strength, can make good quality and delicious bread at home. Or watch the video below. What was AmBank doing during this time? Chasing car loans? Punishing guarantors? I really have served my country beyond the call of duty without any rewards. It was because I spent many years carry out research without any income that I managed to save my country billions of ringgit in losses during the 1997 Financial Crisis. As a result Malaysia is not in debt to any foreign power or authority. Why is AMBank punishing me a 3rd time? Why is AmBank continuously trying to attack me over the same alleged charge? Every few years, after dropping the alleged charges, they reinstate them. There must be something or someone else behind these attempts. After the way AmBank had put me through hell all these years I have several recommendations to be implemented by all governments around the world. 1. Guarantors cannot be blacklisted by CTOS or any other credit rating agency, as they did not borrow the money. The guarantors did not benefit from the banker & borrower relationship. What did they gain entering into this partnership? Are they allowed to drive the car any time they wanted? Did the bank pay them monthly compensation for standing in as the guarantor? Why does not the bank manager or officer stand in as the guarantor, after all they are the ones who approve or disapprove the car loan? 2. The banks can only make one claim against guarantors and if that fails they cannot make the claim again for second or third or more times. 3. Banks must operate under the country's law. They should not be allowed to do as they please and must be investigated if they do. 4. Lawyers taking guarantors to court on behalf of the banks must be disbarred from practicing law if they do not have or will not reveal documentary evidence against the guarantor. This is because the lawyers will be gaming the legal system and using the fear of the courts to blackmail guarantors into making payments. 5. Car loan guarantors cannot be declared bankrupt as it is up to the banker to choose their car loan clients wisely and carefully. 6. As the bank cannot operate their lending business without guarantors, 50% of the interest charged by the bank must be paid to the guarantor as compensation to him as the bank could not close the car loan deal without the guarantor. For example, if the bank charges 6% per annum then 3% must be paid to the guarantor on a weekly or monthly basis if the loan repayments to the bank are on a weekly or monthly basis. This is because the bank is unable to operate its banking business without the guarantors - they are business partners and must be duly compensated for their assistance. This compensation of guarantors occurs in other business deals so it should be carried out for car loan guarantors. Where is the justice in Malaysia? It is all about the abuse of power, isn't it?